How to make a quick South Indian meal in under 30 minutes – vegan and gluten free too! The beauty of Tamil Brahmin cooking as I’ve already said many a time here, is its simplicity. No time consuming gravies, no rotis 😉 and if you have a pressure cooker, I can promise you many a sumptuous menus in clearly under 30 minutes. Most of my friends gasp when they hear that I make at least 2 meals a day if not three, all fresh. But then I spend an average of an hour to hour and a half max in the kitchen each day, which is really not much, considering that cooking is one of my loves! Wash and soak the dal (1/2 cup tur dal) so that it cooks easily. Soak a lemon sized ball of tamarind in 1 cup water (omit if using tamarind paste). Pre cut green beans 1 pound – frozen or cut the previous night while watching re run of Friends. Start with the beans. In a large wok, heat 2 tsp oil. 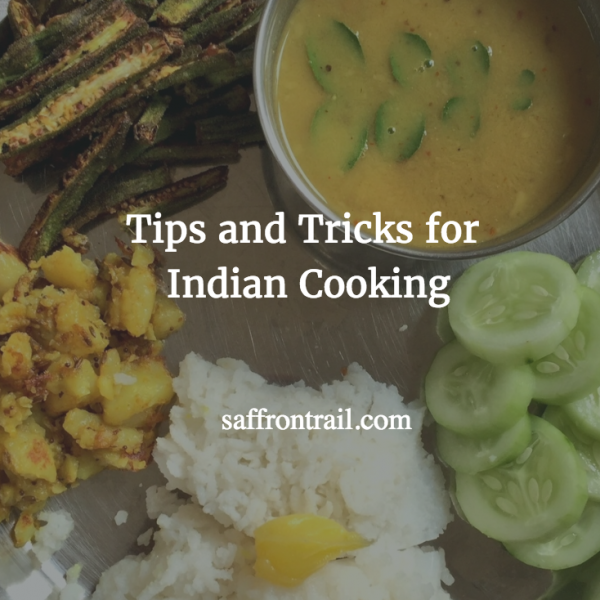 Put in 1 tsp mustard seeds, 2 dried red chillies broken into pieces, pinch of asafoetida. Once mustard seeds pop, add 10-12 curry leaves, 1 tsp udad dal, 1 tsp_ chana dal_ and saute till the lentils turn golden. Put in the finely chopped green beans, 1/2 tsp salt and saute till well mixed with all spices. Add 1/4 cup water, cover and let it cook for 15 minutes. While lentils are turning golden, cut 100 gms of golden pumpkin into bite sized pieces and place in one of the cooker vessels with 1/2 cup water. Keep aside. Set ingredients for cooker. Place 2 cups water at the bottom of cooker. In the lowest vessel, place the drained, soaked yellow lentils with a pinch of asafoetida with 1 1/2 cups water. Place the container with pumpkin pieces over the lentils container. In the uppermost container, place 1 cup washed broken wheat or rice with 2 cups water (or as per requirement). Close lid with weight and pressure cook on high flame for 3 whistles. Place on sim for 5 minutes, switch off flame and let cool. In a small heavy bottomed wok, place 1 tsp of gingelly (or vegetable oil) and saute 3 kashmiri red chillies and 1 byadgi chilli, 2 tbsp coriander seeds, 1 tbsp chana dal on a low flame with a few curry leaves, until the chillies are roasted and chana dal turns golden. Meanwhile cut up 4-5 okras into inch long pieces and 1 capsicum into large squares. Remove the roasted spices onto a dish and cool slightly. In a heavy bottomed pan, heat 1 tsp oil. Splutter a tsp of mustard seeds, put in the okra and capsicum pieces with a pinch of salt. Saute for 30 seconds. Meanwhile squeeze out all essence from the soaked tamarind and pour the extract onto the sauteeing veggies with a pinch of turmeric powder. 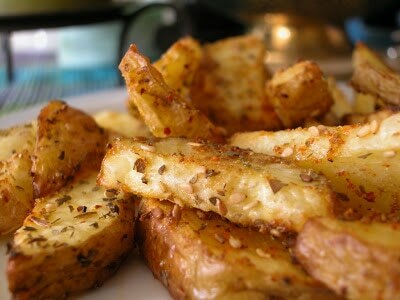 Grind the roasted spices into a fine powder, add 1/2 cup water and blend again to make a smooth liquid. Pour this spice liquid into the bubbling veggie-tamarind base. Let this simmer. Check beans, the water would be absorbed and beans cooked. Remove from wok and garnish with freshly grated coconut (optional). Cooker has cooled off and ready to be opened. Mash the lentils and add it along with cooked pumpkin pieces into the sambhar base. Simmer for minute, check for salt and switch off. Remove the cooked rice / wheat into a large bowl, fluff up and keep warm. Peel two cucumbers, slice and keep aside. Garnish sambhar with curry leaves. 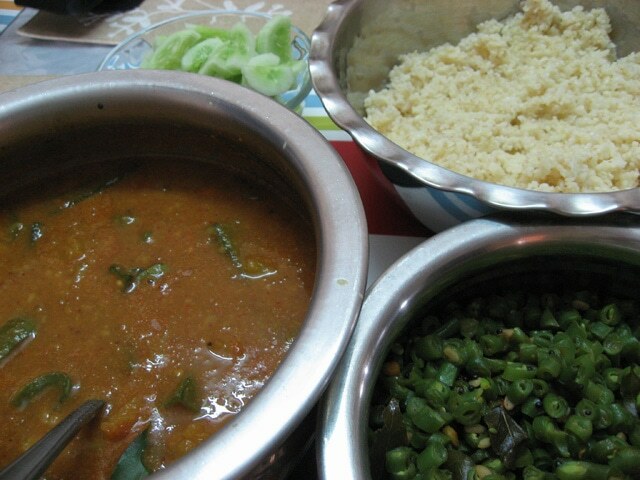 Table set with freshly made sambhar, green beans poriyal and cooked broken wheat. Note: You can easily substitute the freshly ground sambhar spice with ready made sambhar powder and save some more time. Recipe for Green Beans Poriyal is from Jasleen Dhamija’s The Joy of Vegetarian Cooking. Highly recommend this book for all vegetarians where the recipes are listed under each vegetable or food item such as lentils. 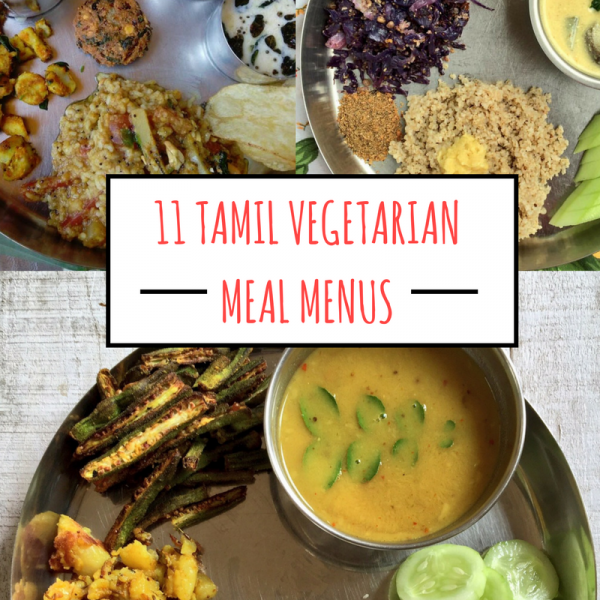 The vegetarian recipes are predominantly from all over India and many from other parts of the world such as Burma, Bhutan, countries in Africa etc. Wow Nandita, that is super quick! 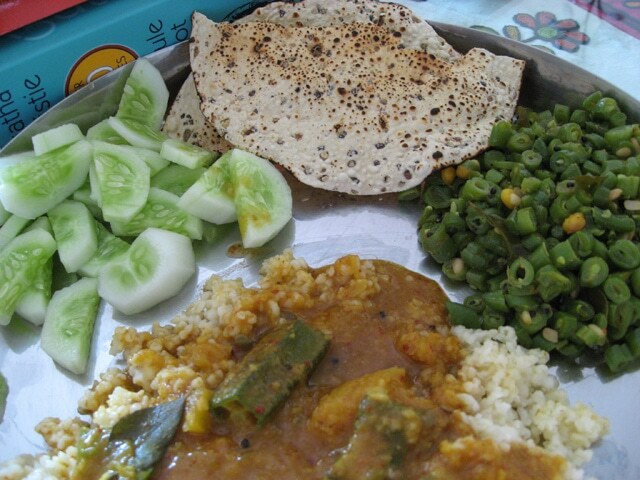 Quick and delicious Thali, Nandita.. Sambhar looks yummy!! You need to have your own 30-minutes meal show. Great job. This is a feast for body and soul! Love the idea of the dalia…I am just weaning myself away from white rice, and this is something I should try too. Thanks, Nandita! Where would we be without our Hawkins! 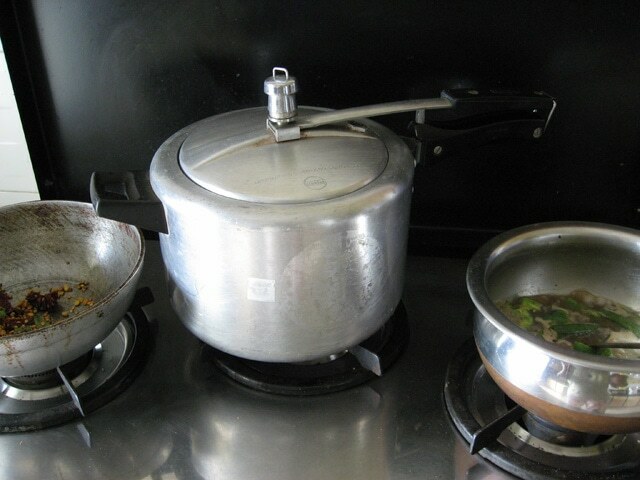 The pressure cooker is the express-cook’s bestest friend! Great meal, N.
nice meal, nandita. i still am good at multitasking inside one pressure cooker. i use 3 differetn ones! but ur sambar really looks delicious.by the way, cheating.. cutting ur veggies earlier. :)no prob though. i agree with you. tam bram meals have to be one of the fastest in the world. 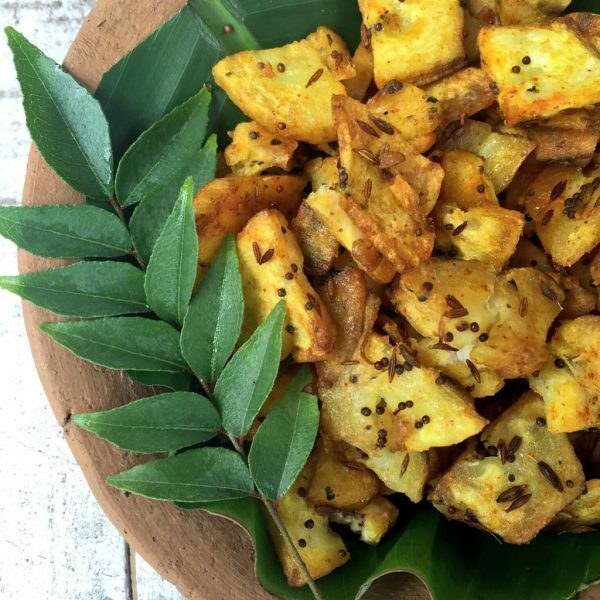 its beautiful to see cooking with barely a few spices transform into a wholesome yummy meal. the other thing that i love about tam bram food is the ever present curd!! :). i make rotis/ parathas 90% of the year on a daily basis, at least for one meal. tam bram food comes to my rescue again, my strategy is to usually make a kootu to go with it. :)PS: amma will reply to your query on idli batter. 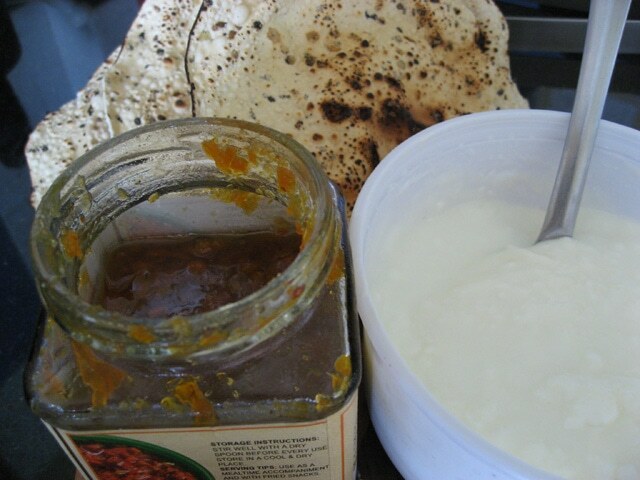 http://saffrontrail.blogspot.com/2007/08/meals-ready-tambram-meal-in-30-minutes.htmlThis is my favorite of all your entries. This’s absolutely the best.